This is an unusual Bollywood film. It’s quirky, funny, charming, unexpectedly experimental coming as it does from two mainstream production houses (T-Series Super Cassettes Industries and Ramesh Sippy Entertainment), brave in its interpretation of the Ramayan considering the penchant for violence of our Indian religious conservatives and – let me say it again – funny… Not in a Sajid Khan-Rohit Shetty kind of way. No no, this one’s a low-key, understated, soft and gentle version of humour. Nautanki Saala is based on the French film Apres vous, neatly adapted to the Indian scenario by writers Nipun Dharmadhikari, Rohan Sippy and Charudutt Acharya. Ram Parmar a.k.a. RP (Ayushmann Khurrana) is the director of a play called Raavanleela running successfully in Mumbai. Ram plays Raavan in the play. We discover early on that the man has a habit of melodramatising everything in his life (hence the film’s title) while also making other people’s problems his own, which is how it comes about that he prevents the suicide of one Mandar Lele (Kunaal Roy Kapur) and casts him as Ram in his on-stage drama while developing a twisted sense of obligation towards the pathetic fellow off stage. Also in the picture are RP’s girlfriend Chitra (Gaelyn Mendonca), Mandar’s lady love Nandini (Pooja Salvi), the play’s Seeta (Evelyn Sharma), the play’s harassed producer Chandra Sir (Sanjeev Bhatt) and Nandini’s beefy boyfriend Lokesh Limaye (Rufy Khan). The film’s production values are excellent and there’s particular pleasure to be derived from visuals of Raavanleela’s lavish stage, glitzy green rooms and costumes. The casting is a big plus point. 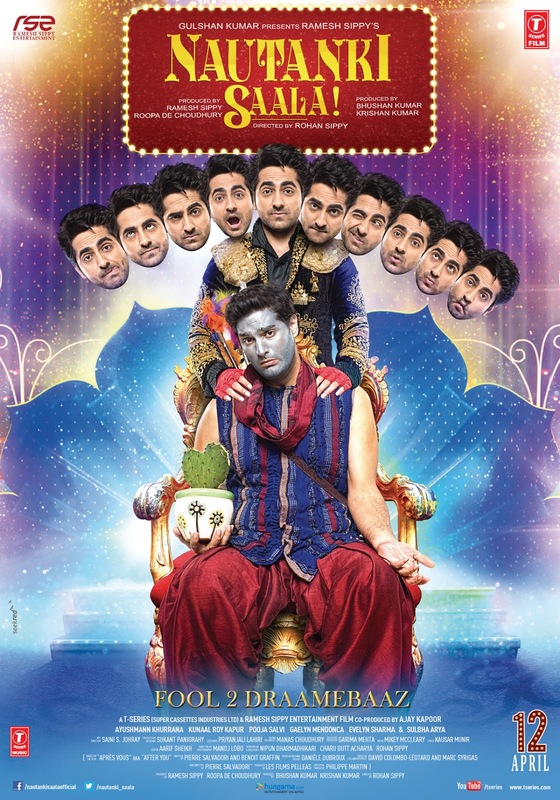 That Ayushmann Khurrana is talented was evident in his first film Vicky Donor; how talented becomes clear in Nautanki Saala as he switches from Raavan on stage to a much-in-love Ram off it, struggling to hide his feelings from everyone. Kunaal Roy Kapoor (the fartbag from Delhi Belly) is equally wonderful as miserable Mandar. The two play off each other really well. The pick of the supporting cast is the delightful Sanjeev Bhatt as Chandra Sir. His perennially theatrical demeanour and heavily accented south Indian Hindi are a hoot. Full marks to Bhatt and director Rohan Sippy for making the character so hilarious without once turning him into the nauseously caricaturish “Madrasi” of an earlier Bollywood era. In fact, despite the deliberately stage-like feel of the film, there are many points at which a lesser director may have gone overboard but Sippy does not, stopping in his tracks at precisely the right point, thus giving us real human beings instead of cartoons. Like the Malayali receptionist at a Mumbai hospital who speaks such heavily accented Hindi at such high speed that she needs a translator, and Mandar’s Maharashtrian Ajji (Sulbha Arya) who could have been an OTT representation of the community or old ladies, yet is not. It’s clear that trouble has been taken even in the casting of Raavanleela’s audience. That’s what you call finesse. Of the three women in RP’s life, Gaelyn Mendonca playing Chitra stands out for her screen presence and acting. Do look out for a restaurant scene in which she’s feeling particularly affectionate towards her boyfriend. Evelyn Sharma has the smallest role of the three but makes it work, especially in that moment when she decides to woo her very own real-life Ram. Where the film falters is in the writing and casting of Nandini. Model-turned-debutant-actress Pooja Salvi is great looking, but does not have the charisma to convince us that not one, not two, but three men (I won’t tell you who) would be madly in love with her. Her acting can’t be faulted but there’s a missing X factor … perhaps she’ll acquire it by the by. Despite this, there’s nice chemistry on display in that first lingering kiss involving her and one of those three men. The film’s music is a lovely blend of old Bollywood tracks and original numbers. Ayushmann seems to have particular good luck with Punjabi songs. After Paani da rang in Vicky Donor, here he composes (again with Rochak Kohli) and sings the lilting Saadi galli aaja. All the songs are woven well into the plot, though none more so than So gaya yeh jahaan reprised from Tezaab. Do stay back till the end of the closing credits or you’ll miss the three girls doing a Dil dhak dhak karne laga. The first half of Nautanki Saala is the lighter half, filled with laughter drawn primarily from RP and Mandar’s interactions. The scene in which Mandar auditions for the role of Lord Ram is a killer. In the second half, just when it seems that the film is slowing down and may not have anything new to offer, the Ram-Sita-Hanuman-Raavan quartet on stage is juxtaposed with the real-life goings-on in RP’s life and there’s no looking back from there. I’m no expert on other people’s opinions, but I suspect Nautanki Saala is a film that many people might consider “too slow” and others might deem “too arty”. A friend I met outside the preview theatre told me he couldn’t bring himself to sit through it. In the interests of full disclosure, you should know that I watched it twice before writing this review. The first time I was stuck at a meeting and ended up missing 19 minutes of the press preview, so of course I had to watch it a second time for a fair critique. That I sat through it till the very end even while re-watching the film (until the theatre abruptly cut off the end credits) should tell you just how much it worked for me. If “arty” can be this funny and this thought-provoking, bring it on! Nautanki Saala is a breeze of fresh air! The screenplay could've been a bit more fast-paced, nonetheless it's brilliant. The performances are top-notch & Rohan Sippy's strong hold on the narrative makes it a delightful comedy!